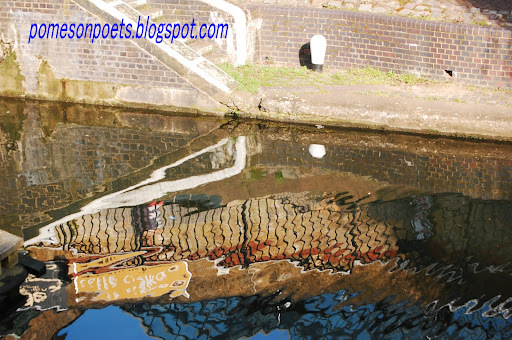 To capture moments with poets - from reading, meeting or imagining - I have started this blog. walking both together on the pavement. some would say Heidi, some that it was Joe. crossed over to the sand and breathed sea air. nor fireflies by right begin to glimmer. One can see them still, though never did I meet them. Lovely. Thank you Ken, so much. Ken: I read it through and was left with a repeated effect I needed to track down. It didn't take long; it was of course the word "they" (or "their" or "them"). Interspersed with "he" and "she" but returning to that insistent third person plural. A common enough word, simple too, but they're always the best if you can make them work for you, This you did. I'd seen the closeness of their deaths as tragic and it remains that way for them. For us, though, the closeness allows us to think of them as a unity as well as individuals and you have seized on this for your wending journey. It was apt that there should be a hint of dispute, (Who swam the furthest, talked the most...) since it was a partnership based on amicable disagreement among other things. That had to be there. The tone is gentle but the characters are three-dimensional if not four-dimensional. And they exist in a combined location. They are recognisably my friends and you remind me - in an elegiac way - about what I'm missing. I couldn't have asked for better. This ballad is musical and comforting. Beautiful! I can still see them together, just as we saw them in their home in 2009, and will always see them that way. Thank you so much for this. I didn't know Joe but almost felt I'd met him through his appearances in blogs I read regularly, such as Lucy's, Marja-Leens'a and Roderick's. So I very much appreciate your poem, Ken, and offer my sincere condolences for the loss of your brother and friend and of his soul-mate Heidi. Brilliant. A perfect finish to Lucy's tale of going and being there. I think I started reading Mr.H's blog in 2012. The day I saw Sitges mentioned and ever since I ask myself if maybe I crossed the couple's path in 2001. I am thinking of magic in the air during their strolls. What a wonderful response and gathering of comment! Joe and Heidi would have greatly appreciated it and I am most moved. Tom, Many thanks. That there is a sense in which Joe and Heidi appear or are seen in the poem is what I had hoped. Lucy, Many thanks for your insights and encouragement to go ahead. Robbie, The "he" and "she" and "they" aspect is something that developed with the compression of the form. I like what you say about the closeness of their deaths allowing us to find them as a "unity". Thanks also for helping me to think about the ballad form. Rouchswalwe, it is great to hear your comment: musical and comforting seems to reflect the concept of a ballad. marja-leena - thank you for reading and responding so favourably. The idea of still "seeing" them is I think what I hoped for. Natalie - thank you so much for your reading and understanding, through the magic of blogging, and communication. Joe and Heidi would have recognised and appreciated this greatly. Sidney - Many thanks. Reading your comment makes me realise how valuable a set of blogs can be. Ellena - your references to "Mr H" are most touching, and even though I have never been to Sitges, I too can sense the magic in the air. For being a mainstay in my attempts to write verse.